I think it’s fair to say this isn’t the easiest task to do with children no matter how long or short the time period of travel is. Most parents I’ve come across dread aeroplane journeys, whilst most nannies I know, myself included, decide to make the most of it. Yes it’s not the most fun activity I’ve ever had to endure but at times it has to be done so let’s do it well! This is one question that has cropped up at pocketnannies several times, so hopefully we can answer your queries here. The key thing we have all found at pocketnannies is that you really do have to be totally relaxed about any sort of routine you have in place for your children. If they want to snack, let them, sleep, let them. Chances are you’ve had to wake up at a different time or travelled to the airport at a strange time and the rest of your day will be slightly out. Not to mention the inevitable time difference on arrival. Remember to give young babies milk or a dummy if you use one when taking off and landing to help their ears (but you may well just have to endure their crying for a while) and older children a drink from a carton or perhaps a lollipop. We’ve put together a list of things that have got us through our travels with children that we hope you take some ideas from for children 0-8years. Make sure you also check out the animation at the bottom of the post for a few more tips. Formula milk (we like Avent milk powder dispenser). Take three extra feeds for young babies…just in case! Nappies/wipes/mat. I always take enough to get us through the first 24hrs of holiday just in case you can’t get to a shop fast enough or luggage doesn’t appear. Snacks. As many as you desire! A small medicine collection (including thermometer) plus any prescribed ones. Again these are all ok to take through security. A warm layer. I find aeroplanes either freezing or boiling hot, never just right. Dressing your child in layers makes it easier to adjust to the temperature. Small books. Make several of them new, several of them favourites. Some touchy-feely for the very young and some with more words. Small puzzles (pictured is a parent and baby animal matching puzzle. If taking more than one, store in sandwich bags to reduce bulkiness. Brick/blocks, not your whole collection(! ), just enough to make a good tower with. Again store these in a sandwich bag. Miniature toys. I have some jelly type dinosaurs and lizards my two charges love. Store these in a container-for this age it’s all about taking things out and putting them back again. Two toys in one!! Mini pompoms. Again in a small container, I’ve used Mini Egg tubes before and the hole is fairly small. This requires quite a bit of concentration and entertained my charge for about half an hour….result on an aeroplane! Stickers. Of anything, however many you like. Don’t be too fussy over where they are stuck-if they want to stick them on the seat, that’s ok for now! Again, at this age they a) normally don’t stick them down excessively so can easily be taken off a surface again and b) quite often children like sticking them down and then putting them back on the card they got them from. Remember, even if it’s not constructive in your eyes, for this moment let them be-it’s getting you through the flight! Pencils and pad of paper. Don’t take felt tips it could just get messy. Good old fashioned drawing should pass some time for these young flyers. Also pictured are jelly shapes you buy for bedroom windows. 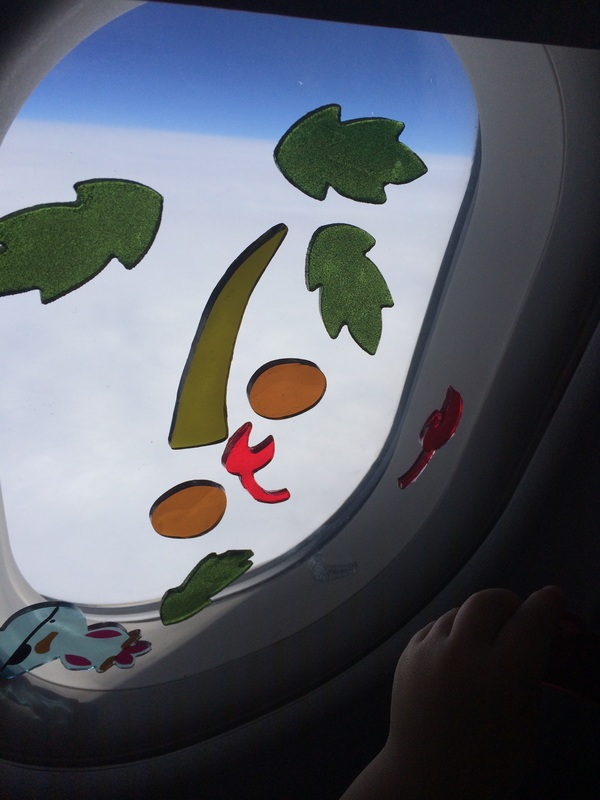 These are GREAT to use on aeroplane windows for children to make their own pictures (please do excuse the fact this parrot looks as though he’s had too much sun, and the crab has wondered off without his pincers!). They also stick to the back of chairs but obviously look wonderful in the window. At the later end of this age range children are often fascinated about their surroundings, and the older toddlers we’ve looked after love pressing all the buttons on the remote controls (if you are on a long enough flight). Let them explore, remembering to just respect other passengers who may not want to be disturbed. However, just don’t fret if they are screaming for a period of time, it cannot be helped. Mini white board and a dry wipe marker or two. Great for games such as naughts and crosses and general drawing. Go fish or similar card game. Story telling dice. These are great, however, you could always make your own story prompts by printing out pictures and cutting them out before you travel. If you are in the car or on a train you could count the number of bridges you see or how many yellow cars go past. Just pick an object you are likely to see quite a few times on your journey. Magazines. A good way to spend bit of your time in departures by letting them choose a magazine for the flight. Wrap up a few small toys, such as small cars, ‘farm in a tin’ pieces, little dolls or similar. The fun may well be in the unwrapping, but that’s absolutely fine. You could even wrap lots of layers just to keep your little ones busy. Place some large beads and some ribbon/string in a small tupperware/sandwich bag to make a bracelet or two. Chapter books. 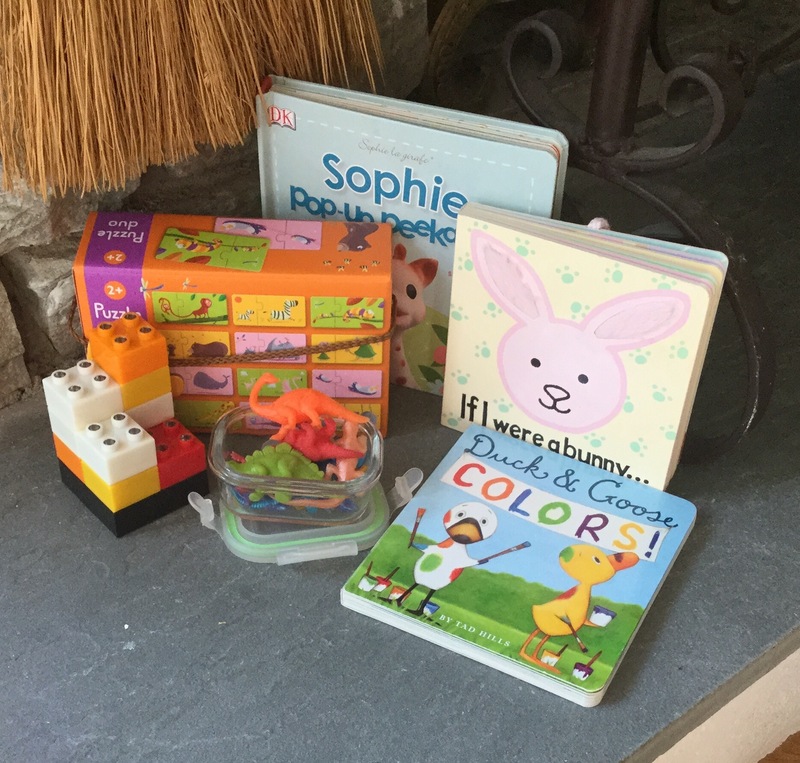 Children love to be read to and a chapter book is perfect for slightly older children. You can always carry on reading a chapter a night to them during your trip away. We tend to put pressure on children to always read to us but sometimes its quite nice for them to listen and let their imagination feed off the story. We hope you can use even just a few of these to help you make it through the next trip with your little ones. Sainsbury’s Bank blog, Money Matters have designed the animation below to help families who are flying with young children. We like how it has condensed lots of useful information into small snippets and we also love the luggage belt of baby paraphernalia!